It's brand new! 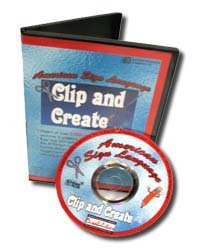 American Sign Language Clip and Create 5 is an upgraded version of American Sign Language Clip and Create. Now you can design your own sign language materials using any of over 3,000 sign clipart pictures and explanatory graphics. Custom printing features enable you to create letterhead, banners, posters, cards, postcards, and labels. New features include the ability to "layer" your designs, and save files as bitmap so that they can be used in other programs. Use six templates to customize crossword puzzles, SIGN-O cards, fingerspelling scrambles, ABC order worksheets, and word finds and also save them as bitmap! Four games - Spell Well, Match Madness, Con-SIGN-tration, and Sort it Out! support spelling, sign language memory, receptive speed, and categorization skills. Each of the over 3,000 sign clipart images includes the sign itself, the English word equivalent, and a conceptual graphic. These can be printed together or individually. Signs can be accessed in alphabetical order or by categories (e.g., Clothing, Food, Actions, Colors). If you are stymied about lesson plans or other creative ways to use the clipart, ASL Clip and Create 5 offers 16 ideas for ways to use the clipart to improve your instructional offerings. The Custom Printing section allows you to create various types of materials (e.g., single and double-fold cards, stationary, 2-5 page banners, labels). Once you have selected the type of material you want to make, you can import sign clipart from the dictionary, use shapes or draw freehand, add text, import other images, and of course, save, and/or print your creation. The new layering feature allows you to decide which pictures to move to the front, and which to move to the back. Each of your creations can be saved within the program, or as a bitmap, to be used in other programs. ASL Clip and Create 5 contains six templates that can be customized by using any of the vocabulary in the dictionary. Make your vocabulary selections, and get instantaneous crossword puzzles, word searches, SIGN-O cards, fingerspelling scrambles, and ABC order worksheets. An Alternate Display button allows you to retain the same vocabulary but create different worksheets. All templates can be saved within the program or as bitmap files! Con-SIGN-tration requires the player to match a sign picture with its English word equivalent. There are nine categories of words and two levels of challenge. The game keeps score of clicks and matches, and entertains with an animation when the game is complete. Because it randomizes every time it is played, there is always a new challenge. Spell Well can be played on any of six categorical gameboards. Use the keyboard on the screen or your own to spell the English word equivalent of each sign picture that appears. Your game piece will follow the trail until you reach the end, when an animation appears. Match Madness is a vocabulary matching speed game. You have four gameboard choices. Once you have picked your gameboard, you can choose your level of challenge by deciding how many words will appear simultaneously (2-6). Click on the word that matches the sign picture that appears. To win, make 10 correct matches before the third item drops. Sort It Out! focuses on categorization skills. A menu appears that asks you to decide the number of categories into which you must sort pictures containing signs and words. After choosing your number of categories, a screen appears with that number of categories and the names of the categories. The categories change every time you play. As a sign and word appear on the screen, you must click on the right category. The game keeps score of the number of clicks and correct choices. When the game is over, you final score is given. Windows 2000, XP, Vista, and Windows 7; Pentium II processor, 64 MB memory, and a CD-ROM drive. We are offering software lab packs for schools and organizations; call Ken Tomkins at 253-353-2761 for more information.